The sun warm on my back, soft grass under my feet, blood surging as I sprinted…I revelled in the joy of being alive. Until the sudden impact on my temple brought me to a full stop. Fingers found blood trickling from my head and pain grew steadily. What hit me? I recalled then the whoosh of wings and the flash of black and white just after the impact. There were a few tall gum trees on the edge of the park, about seventy metres away. A couple of magpies wheeled in the air above them, one swooping in little forays towards me now and then. So there was the culprit! I was a victim of that common springtime event in Australia—a magpie strike. That was many years ago. I still love running but these days the enjoyment is always tempered by vigilance from September to November, when the magpies are guarding their nests from any other life-form trespassing into their territory. 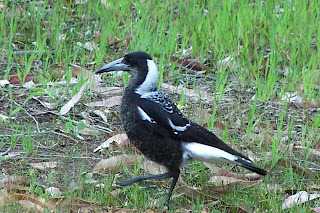 Many runners, cyclists and even walkers deter magpie guerrillas by wearing sunglasses on the back of their heads. The birds won't attack if they think you’re looking at them, only from behind. Nevertheless, Australians have a soft spot for maggies, as we call them. Why? Another personal experience gives the answer. Lying in bed recently, in the stillness before a cool autumn dawn, I was treated to one of the most beautiful musical performances of my life. A group of magpies was carolling in the red gums outside of our cottage. One would begin with a phrase that soared through a couple of octaves, and another would join in with its own phrase somewhat lower. This continued for a while before they paused and began again. It must have lasted for about half an hour. The exuberance of these concerts is something beyond words. I found this female magpie foraging for worms in my backyard. In the bird orchestra the magpie is the clarinet, with a vocal pitch-range of about four octaves. Its versatility with various timbres and patterns—to me they qualify as melodies but some might not agree—is amazing. Add to these attributes a gift for fast learning and you will understand why the magpie is also a wonderful mimic of other birds and animals. What's more, if they spend enough time close to humans they pick up some of our frequent words. I wonder whether they might even love to make music with us. A couple of times I’ve left the window open while I give a student a singing lesson only to hear one or two magpies at the front of my house join in. It gave such a sense of unity with the natural world! Another reason I've had maggies on my mind lately is that they feature prominently in fiction I’m writing. Some of it should be published before long and I’ll let you know where to find it. i have been talking to them all my life. wrote a book with ken spillman - magpie mischief. wherever i go, whenever i see them, i whistle and when i pass that way again, they know me. they have big brains and long memories. oldest recorded living magpie - 38 years. quite common for them to live until 30.
my son won the state science prize for biology for his magpie project. oh, they love sunflowers seeds. Great to have you drop in, Jon! I have developed a whistle that some local parrots respond to. Now that you've mentioned it I think I'll try doing the same with our maggies. I should have mentioned that magpies seem to accept your presence once they realise you belong in the surrounding territory, such as your own garden. They seem to nest happily nearby without swooping you--as long as you don't look as though you're about to climb the tree and threaten the nest.